Bob Miller addresses Heritage's fall 2012 intern class as Heritage Vice President Becky Norton Dunlop looks on. Miller, who built Better Baked Foods from the ground up, knows actions speak louder than words. “My life demonstrates the positive effect of the American Dream. My 50 year story is really a love affair with freedom,” he told the 60 interns assembled in Heritage’s Allison Auditorium for their graduation ceremony. Miller came from humble beginnings making donuts at his family’s bakery. He eventually started a hot dog and pizza stand, which grew into one of the largest frozen food manufacturers in the United States. Miller credits President Ronald Reagan for inspiring him to take advantage of the opportunity America offers. The business he started now has four plants in three states and employs 500 Americans. 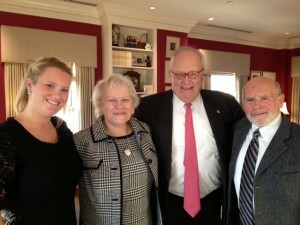 Heritage President Ed Feulner, third from left, with, from left to right, Rebecca Miller, Janet Miller and Bob Miller. Miller and his family are committed to raising up the next generation of conservative business and governmental leaders. The Millers wanted to give more young people an opportunity to understand the constitutional structure and true purpose of American government, so they committed to a $1 million matching campaign to support Heritage’s internship program. 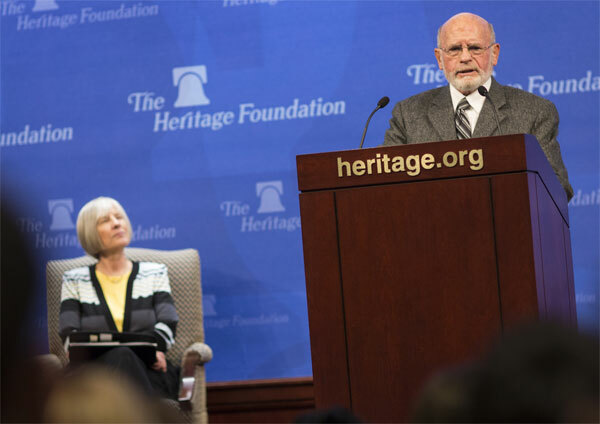 Learn more about the Heritage Foundation Young Leaders Program. Pointless to continue saying what is patently False: “Obama is doing “lawless” things (w/Executive Orders),” WHEN, they have never been illegal Before! But, good luck with that fundraising gimmick/ Pitch – you will need it.